this is just a dj set on you tube. I was looking for actual videos of DJs playing. I edited out your phone number. Not the best idea to post it on the internet. Hey man, Just checking in. I haven't seen you post in a while and wonder if everything is ok? I always thought your input to the forum and mixes were spot on. We're both of the "old guard" in age so just hoping everything is good with you. Respect. Hey, i can't post anythin because my anwser of the random questions are alaways wrong, for example. http://www.flickr.com/photos/80269509@N03/10172407924/ So what i am doing wrong? Im so sorry to ask you in this message, its because i cant post a new thread. I really need help to map my midi fighter 3d. 1.) This is a really stupid question, but how do i map "Shift" button into my midi fighter 3d from my TRAKTOR? the reason im asking this is because i want to move the "Shift" + "Sync" + "Cue Play" + "Play" button into my bottom row buttons on my midi fighter 3D. Because its more convenient for me. 2.) Is it possible to assign the 1st page/bank on my midi fighter 3D to control ONLY the deck A and the 2nd page/bank to control ONLY the deck B on my TRAKTOR? If its possible, please teach me thoroughly how to do that? 3.) Is it possible to combine a tsi. file that is available on DJTT into my own tsi. file? For example if im finished mapping my 1st page/bank for deck A ONLY and my 2nd page/bank for deck B ONLY on midi fighter 3D, is it possible to put the DeckGratMotion v2 into my 3rd page/bank??? If its possible, please teach me thoroughly how to do that? Dear Photojojo i'm writing about VCI-400 + Traktor live streaming can u please help me with it to setup? I'm ready to pay for help please its very importnant to me for presentation Can u give me ure skype or something to make solution in this case? I would like to thank Photojojo for his excellent transaction regarding his Z2. The Z2 works great and was shipped very fast. Thanks photojojo for shipping the Z2 and your great communication for this sale. I can't wait to receive it this week! is the audio 10 still not sold? Is that an ISDT pic for your avatar? NICE. What year? 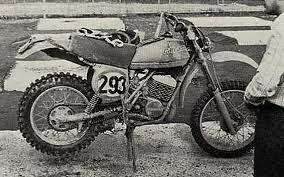 I'll call yours with this one from 1977 in Czechoslovakia: my father (Ron Matthews) on a Can-Am 370 (in the 500 class) was running 4th overall when the frame snapped (just behind the steering head) in a special test on Day 4... Ouch! Was resident in a couple clubs many, many years ago. Back at it now spreading my love of the beat. Eating tacos and saving the world one monkey at a time.